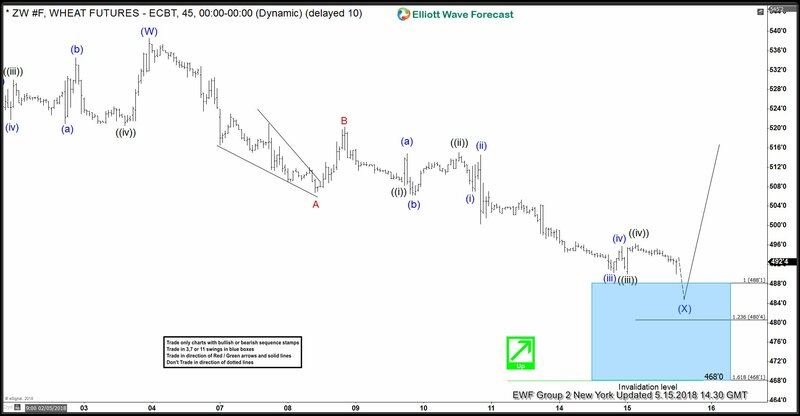 In this blog, I want to share some short-term Elliott Wave charts of Wheat Futures which we presented to our members in the past. 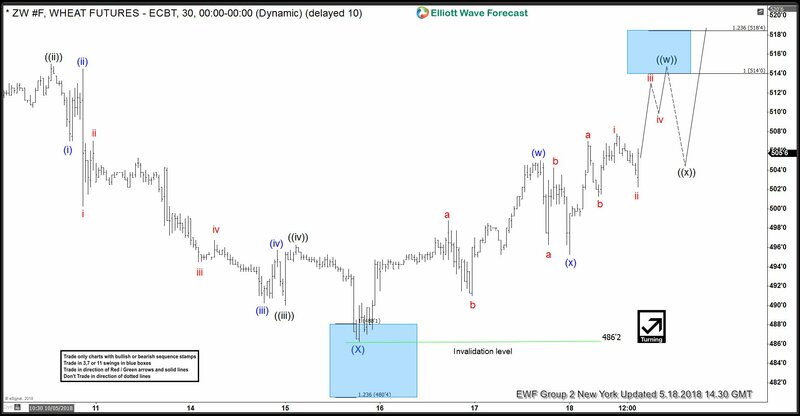 Below, you see the 1-hour updated chart presented to our clients on the 05/15/18 showing Wheat reaching a blue box buying area as a Zig-zag Elliott wave structure. Wheat ended the cycle from 03/29 low, at the high of around 540 (05/03 peak) in blue wave (W). Up from there, it started a pullback to correct the cycle from 03/29. The pullback unfolded as a zig-zag (5-3-5) structure. Due to the higher degree bullish sequence, we advised members that the right side remains to the upside. Therefore, we expected buyers to appear in the dips in the sequences of 3, 7 or 11 swings. 488’1 – 480’4 highlighted 100 – 1.236 Fibonacci extension of A-B and was the first area for buyers to appear to take prices to new highs above wave (W) peak or a larger 3 waves bounce at least. In the last Elliott Wave chart, you can see that Wheat rallied to the upside, confirming that blue wave (X) was in place. The rally was unfolding as a double three in blue wave (w)-(x) from 05/15 low. So our members bought the equal legs from 488.1+ areas and any trade from that area are risk-free by now, targeting higher levels. This current trade is doing very well and our members are enjoying the current rally. 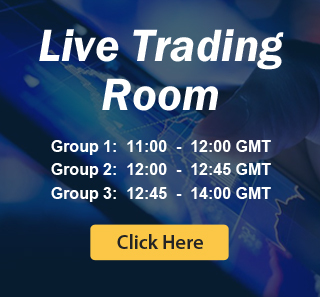 Join us today for a 50% Discount on All Plans Promotion and trade our profitable blue box areas.